The Wolverines went to Ohio this past weekend for a pair of games against the Buckeyes and came out of the weekend with their unbeaten streak in tact (and now up to 9 games). 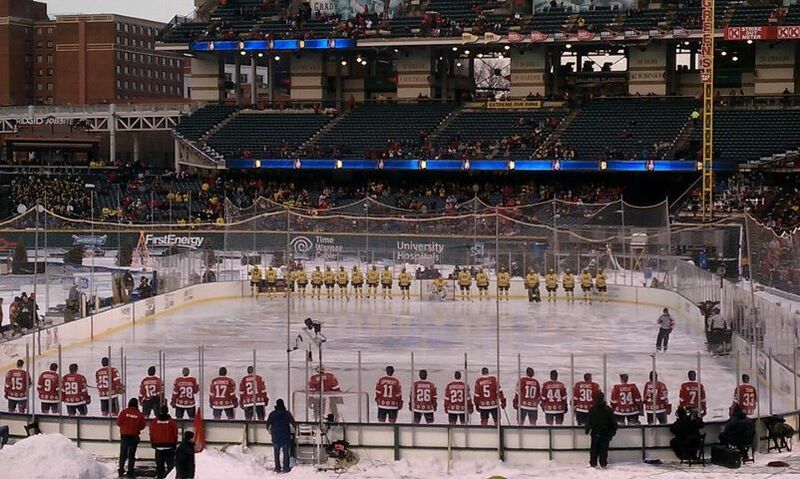 After a 4-0 win on Friday night in Columbus, Michigan absolutely dominated the Frozen Diamond Faceoff to draw within 5 points of the Buckeyes in the CCHA standings. On Friday, Michigan got a career-high 46 saves from Shawn Hunwick en route to a 4-goal win that was closer than the final score. Alex Guptill's shot in the middle part of the first period was kicked out to the right by Cal Heeter. The puck went right to Lee Moffie who sent a laser into the open net to give Michigan a 1-0 lead. Late in the first, AJ Treais sent a shot through traffic one second after a Michigan power play had ended. That was all the offense Michigan needed. Hunwick was perfect on the night, stopping 19 shots in the first, 14 in the second, and 13 in the third. Michigan would add empty-net goals from Luke Glendening and Alex Guptill for the final margin of victory. My notes are pretty brief since I got home from my hockey game at 10:30 or so and still had to pack for Cleveland. I made it a goal to watch the game on the DVR in an hour. I did note that I thought both PDG and Wohlberg had quite a few chances. PDG, in particular, was buzzing even though he was held off the scoresheet. Jon Merrill had two assists and was +3 in the game. He also rang a shot off the post late in the game as a power play was ending. Guptill had 1-1--2, was +2, and drew a pair of penalties in the third period as the Buckeyes were trying to mount a comeback. Treais had a goal and had several really nice passes. One in the first period set up Glendening beautifully in the slot and a Buckeye back-checker probably saved a goal. I thought the shot totals both ways were somewhat inflated. Maybe not, but OSU was credited with 19 in the first period and that seemed really high. Don't get me wrong, Hunwick was certainly tested in this one--he earned that shutout, particularly with a stop on Angelli in the first period and Dries in the third--but it didn't feel like 46 saves. Then again, I swore his career high in saves was something like 162 in the North Dakota game last year. On the blueline, Mike Chiasson and Kevin Clare were both +3 and Clare added a pair of assists. Jon Merrill's only impact on the stat sheet was a single shot on goal. He had no points and was even on the night, but OSU Coach Mark Osiecki saw enough to call him the best defenseman in the country. Brown kicked off the goal scoring. A shot from Clare hit him. With his back to the goalie, Brown collected the puck, spun around, and shot. Before the puck even left his stick, you could tell that one was going in. Shots like that are hard for a goalie to track, and we were sitting right behind the OSU net and could tell Heeter wasn't going to be able to get his legs closed. Michigan made it 2-0 six minutes later on as pretty of a pass and shot as you might see all year. Heeter made the initial save on a Mac Bennett shot that probably going wide. He left the rebound out a couple of feet in front of him. Brown picked it up and threw a nifty little no-look drop pass to Guptill who just sniped one into the top corner over Heeter's glove. Guptill did a little "called strike three" motion after the goal. The puck from that goal is actually going in my puck case. They were selling game-used pucks, including the Michigan goal pucks. I gave them my contact info and got a call today giving me first crack at which goal puck I wanted. As a puck collector, I'm really excited about that one! Not only was it the prettiest goal of the night, it was the game-winner to boot. OSU drew back within one on a power play goal early in the second period. They nearly tied it a few minutes later, but a great shoulder save by Hunwick and a diving play by Pateryn to break up a 3-on-1 after a turnover kept Michigan ahead. The Wolverines iced the game with goals 28 seconds apart in the middle part of the frame. The Buckeyes tried wrapping a puck around the boards and out of the zone, but Wohlberg stopped it on the sideboards. He shot it in front where Derek DeBlois was waiting to tip it past Heeter. If that goal didn't take the wind out of the Buckeye sails, the next one surely did. David Wohlberg drove hard to the net and the puck kind of rolled off his stick, right underneath Heeter. That was it for the Buckeye goalie. OSU outshot Michigan 11-10 in the third, but never really seemed like they had a prayer of getting back into the game. A couple of very late penalties gave them a 5-on-3, but the Wolverines were able to kill off the remaining time and head home with a 4-1 win. Guptill and Wohlberg each have 3-5--8 lines in their last four games. Brown has 3-4--7. Between having a true top line, getting the best defenseman in the country back in the lineup, seeing Kevin Clare's confidence continue to rise after the GLI, and having Shawn Hunwick in net, it's easy to see why the Wolverines were able to sweep a highly-ranked opponent on the road. If the pucks start going in for the second line at some point--PDG has been all over the place lately and hasn't been rewarded--they're going to be a really dangerous team. If they aren't already. The wins take Michigan up to #5 in both the PWR and the RPI. They're now in third place in the CCHA, but things have gotten a little thrown off because of games in hand. It doesn't get any easier with the road games. Michigan will now head to South Bend to take on the co-#5 Fighting Irish. Friday night's game will air on the NBC Sports Network (fka Versus). Saturday will be on the CBS College Sports Network. Notre Dame is coming off a pair of losses to Western Michigan, but recently beat Minnesota and Boston University. More on them later in the week. 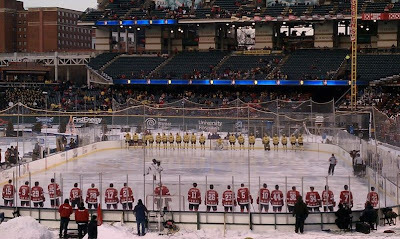 One thing to mention: I know people have made a lot of jokes about the crowd, but I thought the Frozen Diamond Faceoff was a really great event. The announced attendance was probably pretty close to legit, Progressive Field is beautiful, the weather was perfect, and so was the outcome. I don't know for sure, but I'd imagine that they made pretty good money on that one. The rink was already installed for their Snow Days, so to have an even with ~25k (especially at those ticket prices) isn't bad at all. I'd go back again. I'd also like to give a tap of the stick to Angel in the pro shop for helping me out in landing the goal puck. God, that went right over my head too...but that is really funny.